10 Tips to Say it LikeSo! Be aware of your own verbal habits: Do you say “like,” “ya know,” “whatever,” “totally,” etc.? Hone in on what unnecessary words pepper your speech with mindless repetition and work on getting rid of them. Learn to brave the pause: Instead of filling what should be empty spaces in our speech with “ummms” and “ahhs,” take a breath and allow yourself and your colleagues to absorb your thoughts and ideas. Speak with conviction and avoid “uptalk.” The upward glide or “uptalk” that ends would-be statements in a question mark is often used by women to gain consensus and likeability, however, it does not inspire confidence. What happens in rehearsal ends up on stage: Before an important interview or presentation, rehearse in front of a video camera. You may be surprised at your own verbal crutches, and the videotape doesn’t lie. 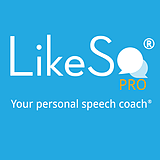 Find a great speech from an eloquent speaker (e.g. Hillary Clinton, Sheryl Sandberg, Lady Gaga) and read it aloud. Hearing what good writing sounds like will reinforce good communication habits and help you develop your own voice. Avoid the baby voice trap: To feign innocence, illicit sympathy and seem appealing to men, some women raise the pitch of their voices. Don’t. Leave vocal fry to the Kardashians. Inspired by our celebrity stars, a new study finds that this pop-culture “creaky voice” that has found its way into our speech patterns may affect women’s chances of getting and keeping a job. Keep your social media feeds clean: What you write on social media channels translates into how you are perceived. Make sure your competence shines through in the written word as well.